​Augusta Maclean is a Scottish artist who studied Fine Art at Oxford Brookes University, graduating in 2016. 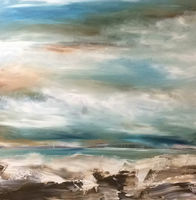 Now splitting her time between Edinburgh and the Highlands she creates her atmospheric work. With the use of thick acrylic layers Augusta shapes abstract Scottish landscapes, which tend to be moody and distinctive. Palette knives and brushes are manipulated to create the landscapes in their abstract form through which the viewers’ mind may create their own story. Augusta's work is to do with her own recollections and impressions, which come to light through her use of found objects, photography and painting to create landscapes. Her work centres around her own memories growing up and the landscapes are formed from this in her mind. She uses found objects and paintings to shape her memories which manifest themselves in different forms of landscape art. She is currently Artist in Residence at St Vincent's chapel. © COPYRIGHT AUGUSTA MACLEAN, 2018. ALL RIGHTS RESERVED.